We catch up with Planet X Team Rider Felix English and how his season has been going over the summer. Felix has been branching out this summer spending more time racing on the road as well as the boards to build up the best possible fitness base for his attack on the Track World Champs. In a hectic schedule, he's raced at the Irish Track Championships, the Kazakstan Pro Expo Criterium (against the likes of Froome and Landa). He raced the World Track Omnium Qualification in the Czech republic (pulling a 3rd place out of the bag), the U23 European Track Championships and a couple of Italian 6-day track meets that he raced back in July. We headed to Giorni delle Rose in Fiorenzuola this year in a slightly different headspace to the previous season. Last years edition marked the start of our Madison campaign and with next to no experience it was certainly a steep learning curve. Coming back in 2017, we not only had two UCI World Cup medals under our belts but we also had two Irish pairings. For a nation that 2 years ago had no riders even considering the event, to now having 4 riders who are able to compete against world class fields, really highlights the work that's been put in by the riders but also the effect national coach David Muntaner has had on the entire team. Since Madison was renounced as an Olympic event, the level in international competitions has really increased. Every nation is sending their best riders across Europe to pick up essential UCI points in order to qualify for the World Cups, World Championships and consequently the Olympics in a few years time. The 2017 Giorni Delle Rose Six Day was packed with talent with the likes of; World Madison Champions Benjamin Thomas/Morgan Kniesky, World Points Race Champion Cameron Meyer, and World Scratch Race Champion Adrian Telinski. The following week in Giorni di Torino Six Day was no exception to this and was headlined by reigning Olympic Champion Elia Viviani making his return to track racing. We headed into the first six-day with no real expectations - we had primarily gone to Fiorenzuola to secure some more UCI points in the afternoon racing but also wanted to show ourselves in the six-day events to help secure a place in the winter editions. Last year, in the flying lap we placed highly in the top 5 each night which was our main source of points but this year we managed to consistently be in the top 3. 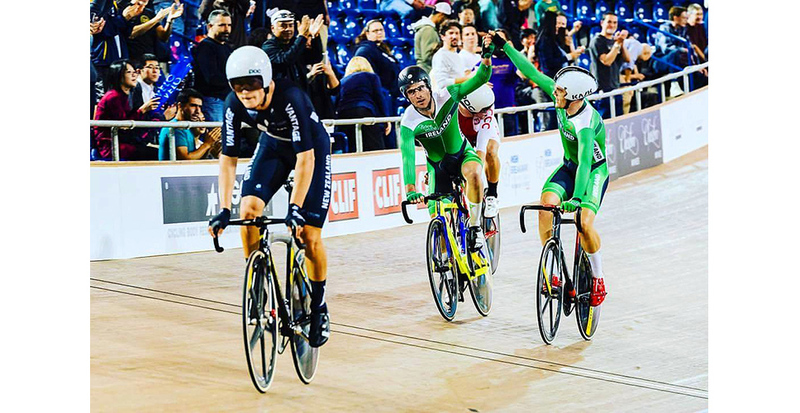 We tallied up points pretty quickly via that and combining that with both Irish teams scoring most nights in the Madison we came out of the event with high placings in the general classification. The highlight of the week was finally cracking one of the Madison chases and with Downey, we managed to take the win after numerous attacks. We finished just ahead of the world champions Thomas/Kniesky. With Fiorenzuola finished Marc and I sent the babies of the team off to the U23 Euros whilst we hopped in our hire car and headed across Italy to Torino. We tried to make the most of our recovery day but it wasn’t going to stop us feeling pretty fatigued on day 1 of the next six days of racing. Fortunately, the first night just consisted of a flying lap and again we finished top 3 just ahead of Viviani/Lamon. As the week progressed it was clear that the team to beat was that of the Olympic champion but as much as we tried, we couldn’t rid ourselves of the team in black. We momentarily went into the lead of the general classification on day 5 when we took the first lap of the event but predictably as soon as we made contact the Olympic champion and his partner were heading off into the distance to put themselves firmly back at the top of the rankings. After a tough and tactical six days, we finally managed to defend our place overall and we finished up in 2nd. A first professional six-day podium for Ireland and also another Madison chase win to back up the win in Fiorenzuola. All in all, the progress we’ve made over the past 18 months has been crazy. A combination of David’s training regimes and also his experience in the Madison has really catapulted us into the top tier of Madison nations in the world. Our focus is now firmly placed on qualifying this event for the Olympics along with the omnium. The way the ranking system works has recently changed - with now every points scorer from your nation counting towards the overall world ranking. The new ranking now makes it harder for us to compete with the larger track cycling nations, who have 10+ guys racing UCI ranked events year round but with the current crop of 4 elite track riders we have and the up and coming juniors, I 100% believe we can qualify for the next Olympics. For this to work, each rider needs to be given as much support as possible, so we can race and hopefully win year round. This is the best and potentially the only we can secure that elusive spot in Tokyo. Each of us has shown that we’re capable of taking on the worlds best, we now just need to continue the hard work, keep learning and race throughout the winter and summer picking up points. If so, we’ll have another Olympic event come 2020, notably also an Olympic event we have a real shot at medaling or even taking home an Olympic gold.